In association with Alzheimer’s Research UK, Hartlepool’s Showroom venue are hosting the first ever Plug & Play Live Music Marathon on Saturday 29th November. The event will see 25 acts from the North East donating their time and talent to the cause, helping to raise money for the charity by playing gigs across two separate stages. The Approach Training Main Stage hosts a range of talent from 3 At Sea, Abel Raise The Cain, Village Green and headliners The Purnells, before DJs take the festivities into the early hours. Meanwhile, the NE Volume Acoustic Stage presents headliners Pek & Wanley alongside Zach Said, Christian Darby, Alistair Sheerin and plenty of other performers. There’s plenty of opportunity for punters to see a range of performances from the talent on show and all the proceeds from wristband sales go directly to Alzheimer’s Research UK. 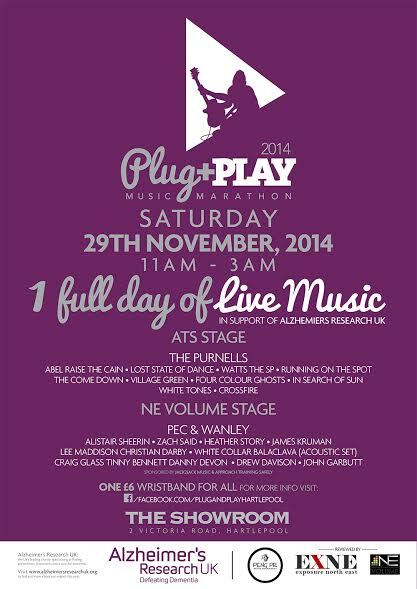 Plug & Play Live Music Marathon takes place at The Showroom, Hartlepool on Saturday 29th November.